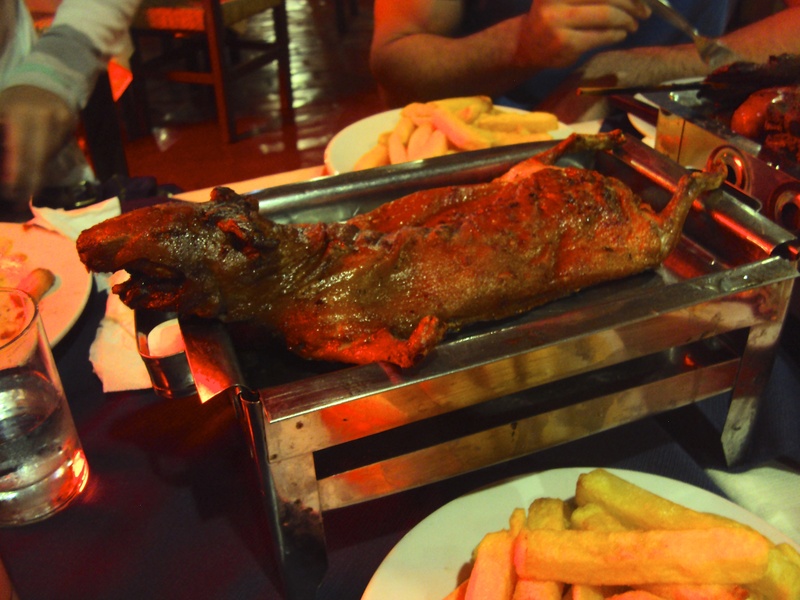 Guinea pig, or cuy (pronounced koo-ee), is a delicacy throughout the central Andes that is often the main course for holidays, birthdays, and other special occasions. Of course, a special occasion is not a requirement. In fact, it’s estimated that Peruvians consume about 65 million guinea pigs each year. The cuy is such a central figure in the Peruvian diet and culture that many towns hold an annual festival simply to exalt the furry rodents, complete with cuy costume contests. And during our visit to the San Francisco Monastery and Catacombs in Lima, we saw a gigantic recreation of The Last Supper in which Jesus and his disciples were dining on guinea pig. 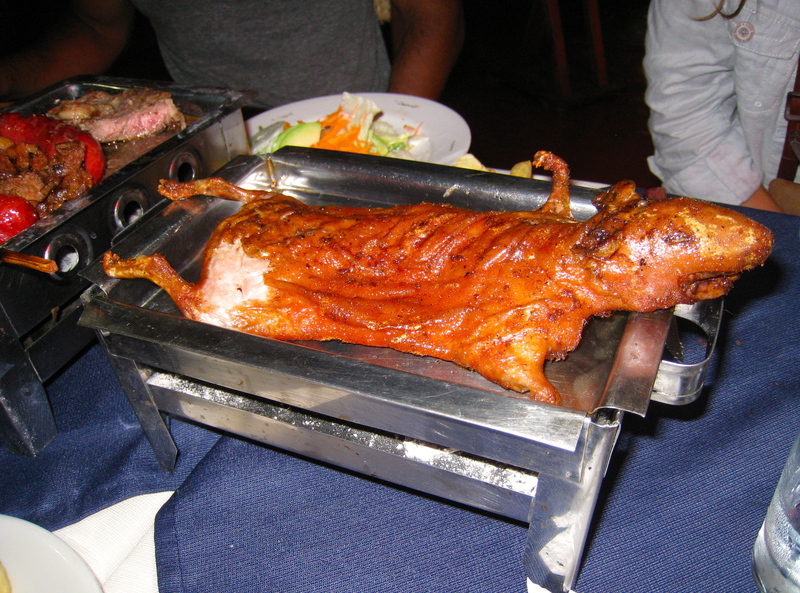 Depending on the region, cuy may be served roasted, broiled, in stews, or skinned and fried to a crisp. I’d been eager to give the strange meat a try, til I laid my eyes on the presentation. Restaurants throughout the country advertise the erstwhile family pets splayed out on top of a salad and some fries, with their mouths agape in what I can only imagine is a final scream of terror. (Seriously, do a Google image search for “cuy Perú” or just see below). I’m not generally squeamish about faces on my food. But something about roasted guinea pig face pushed my limits to the brink. 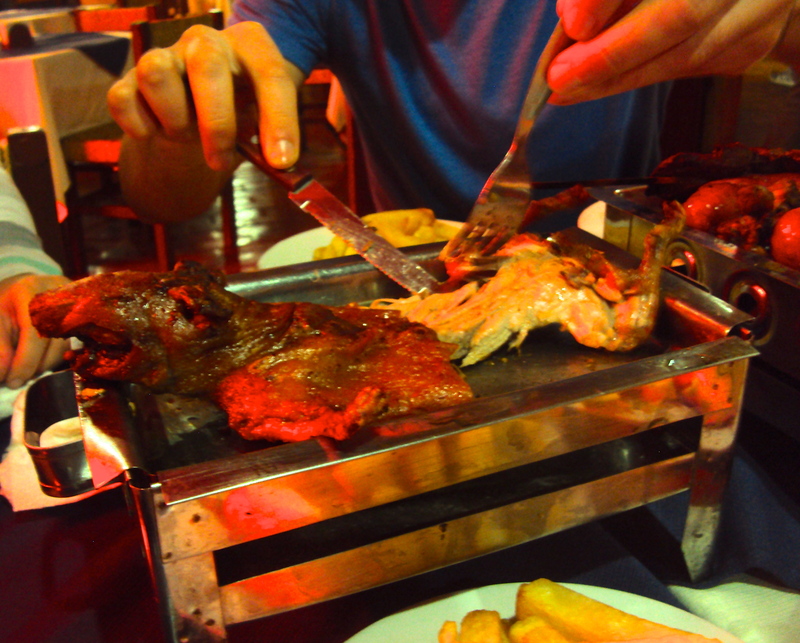 We waited until two of our friends joined us in Lima before taking the leap of ordering one. We figured that way, the pressure to finish regardless of the mental anguish could be spread between four of us rather than two. This was a wise strategy. I was able to take a couple bites before that roasted scream got the best of me. And perhaps my opinion is not objective as a result, but I didn’t really care for it. The skin was nice and crispy, which I generally love. But it was greasy, and the meat was gamey and stringy. Though some compare it to rabbit, I have to disagree. But then again, I was under duress. Lest you think guinea pig dinners are limited to South America, a recent NPR article “From Pets to Plates: Why More People Are Eating Guinea Pig” details how the humble cuy is gaining popularity in the USA. Thanks to the influence of South American restaurants and concerns about the environment, many activists are pushing guinea pig as “a low-impact meat alternative to carbon-costly beef” that’s high in protein and low in fat. While the article makes some excellent points in that regard, I also know that eating crickets and other insects is highly nutritious and good for the environment. But do I see myself embracing the notion of sitting down to a dinner of bugs? Not so much. Would you ever give cuy a try? If you have, I’d love to know if my assessment was skewed by my squeamishness. I’ve also eaten cuy, and while I have to say my reaction wasn’t as strong as yours, and I ate most of mine, it was quite similar! I didn’t find it appealing. I was a little disappointed by my cuy, which was a la parrilla, because it didn’t seem to have much meat and I was promised it would be delicious, but to me it didn’t seem as fantastic as I’d expected. Ultimately, though, I think this all boils down to a matter of culture and customs — if you’re not Peruvian, the idea of eating it is probably not going to sit well with you as you’ve never grown up with it. On Bloglovin’? Follow Me Here!